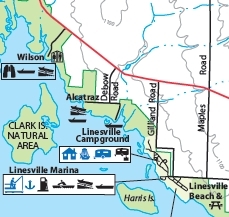 There are 94 campsites in Linesville Campground. Water is available from central locations, not at each site. There are sites with and without electricity (roughly half and half). The electric is primarily 30 amp hookups but there are a few sites that offer 50 amp outlets. RV sites have camping pads that vary in size from 30' to 65' and there is a dumpstation at the campground. There are hot showers, bathrooms, and coin laundry facilities in Linesville Campground. Pets are not allowed in the overnight camping area. Five cabins are also available for rent at Linesville campground. A few campsites and all the cabins are handicap accessible. Camping sites in the Jamestown Campsite vary but include a fair mix of amenities that can accommodate many different kinds of visitors. Water is available from central locations, not at each site. There are sites with and without electricity (roughly half and half). The electric is primarily 30 amp hookups but there are a few sites that offer 50 amp outlets. RV sites have camping pads that vary in size from 29' to 65' and there is a dumpstation at the campground. There are hot showers, bathrooms, and coin laundry facilities in Tuttle Campground. Just in case you forget anything, there is a camp store that sells some basic food items and camping supplies. Pets are not allowed in the overnight camping area. There is a boat launch at Jamestown. Twenty cabins are also available for rent at Jamestown campground. 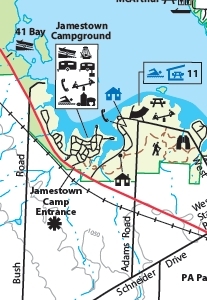 There is a large group campsite available in the Jamestown area. It can hold up to 400 people. Contact the park for more information. A few campsites and one of the cabins are handicap accessible. 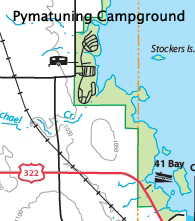 There are 352 campsites in Pymatuning Campground (331 sites have 20 or 30 amp hookups and 21 sites have no electricity). A number of sites that are right next to the water are considered premium sites. They cost more a little more than a regular campsite. There are two dump stations for RV's. If you don't want to set up or break down any camping gear, there are three yurts available for rent. The yurts are round canvas structure, with a wooden frame, and are built on wooden platforms. Two yurts can sleep five people and the third, Yurt 73, can sleep 6 people. A small deck is built into the platform, which has a picnic table on it. Inside there are futons and overhead bunks for sleeping, a 2 burner gas stove, a sink with cold water, a microwave oven, and a small refrigerator. The campground has heated showers, restrooms, and laundry facilities. An on-site camp store sells snacks, drinks, and camping supplies. There is a small beach near the center of the campground, a playground, a basketball court, a volleyball court, and a nature center. If you want to bring your boat, there is a boat launch in the campground. If you want to fish but have no boat you can try your luck from the fishing pier. Do you have a pet you would like to bring? The campground is divided into 3 areas. Pets are welcome in most parts of area 3 and are not permitted in camp areas 1 and 2. Pymatuning State Park has 26 family cottages (sleeps six, heated, available year-round) and 32 standard cottages (sleeps 4, available May 1 – November 1). There is also a premium cottage that includes a dishwasher, a wood deck with gas grill, central air, and a 3-person spa. Family cottages include gas fireplaces and microwave ovens. All cottages are furnished with cable tv, outside grill, fire ring, linens, towels, and cooking/eating utensils. Four cottages are designated pet-friendly and allow you to bring your dog. Reservations may be made up to one year in advance. There is a small beach available for cottage guests. Call 866-644-6727 if you would like to find out more. Find out more about rules, regulations, reservation policies, and dates when Pymatuning campground is open or go right to the state of Ohio Pymatuning Park web site and click on the appropriate campsite reservation button (cottages, "getaways"/yurt, or campsites).